Squamous cell carcinoma is the second most common form of skin cancer in humans (Basal cell carcinoma is the most common). It takes its name from the cell of origin, i.e. the squamous cell. Basal cells (which are at the lowest/basal part of the epidermis) are responsible for dividing to produce new skin cells to replace dead skin cells that flake off from the surface of the skin. The new cells that are formed are pushed up from the lowest part of the epidermis. As the new skin cells move closer and closer to the surface they become flatter and broader. These flat, broad cells are known as squamous cells after the Latin word squama meaning scale. If one of these squamous cells becomes cancerous (i.e. starts to multiply uncontrollably) it forms a collection of cells called a squamous cell carcinoma. Carcinoma is just another word for cancer so these can also be called squamous cell cancers or SCCs for short. Who is Likely to Develop a Squamous Cell Carcinoma? Squamous cell carcinomas occur most commonly in areas of the skin that have had significant sun exposure. People who get squamous cell carcinomas have generally had a sustained daily sun exposure over many years and commonly have outdoor jobs such as farmers and labourers. People who have spent many years of their lives doing outdoor sports also have a high incidence of SCCs. They are generally tanned and appear prematurely wrinkled. The most common age to get one's first squamous cell carcinoma is in one’s 50s. They occur twice more commonly in men than in women. What do Squamous Cell Carcinomas look like? The SCCs appear in areas with the greatest sun exposure, i.e. the face, neck, scalp, arms, hands and upper chest. They often start off as a raised, rough, flaky area on the skin. 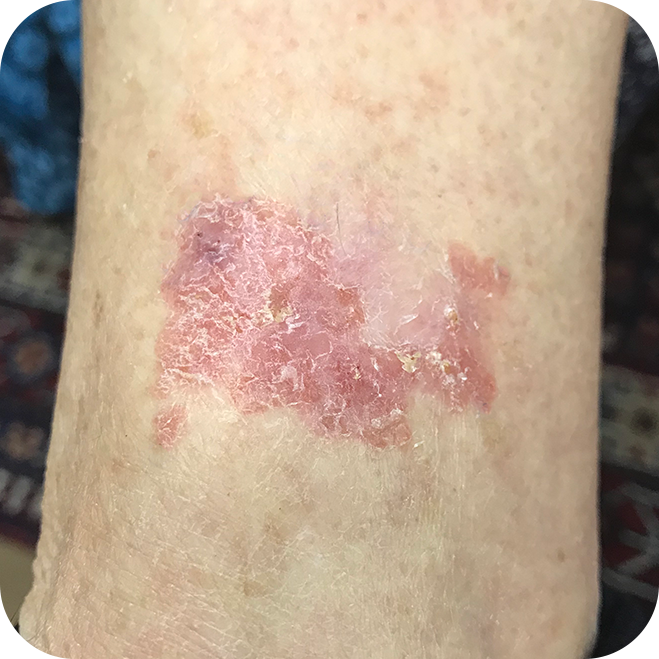 As the SCC grows, a lump begins to form in the skin. This lump can be tender to touch. Another common appearance is that of a Bowen’s patch. This is a red, velvety patch on the skin that is slightly rough. It may be sensitive to the touch and produce a burning itch. 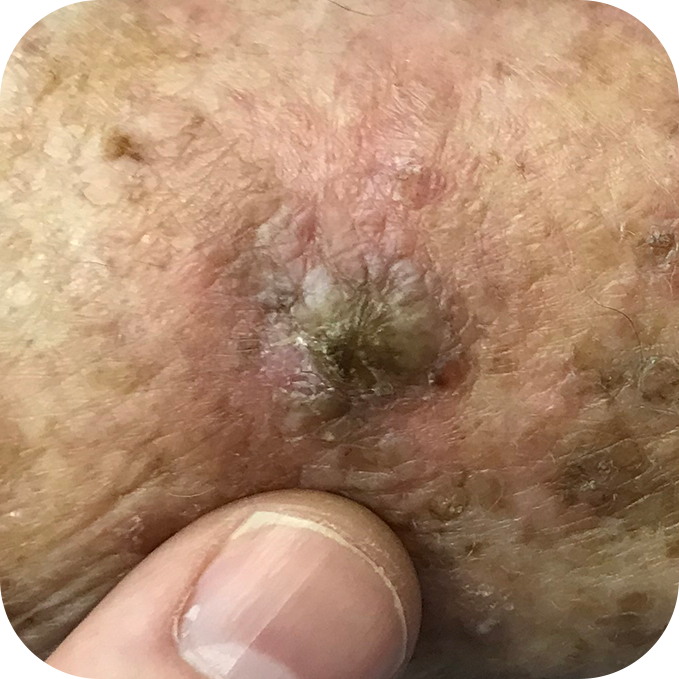 A Bowen’s patch is an area of squamous cell carcinoma that is confined to the surface of the skin and has not yet started to grow into the dermis. The technical name for a Bowen’s patch is an in-situ SCC. If left untreated, the Bowen’s patch will become invasive. Do Squamous Cell Carcinomas Spread? If an SCC is allowed to continue growing, it will enlarge in diameter and also grow deeper into the skin. Once an SCC has reached a size of about 2cm in diameter or it has penetrated 6mm or more into the skin there is a significant risk of the SCC metastasising (i.e. spreading to another area in the body and then starting to grow there). If an SCC metastasises, it most commonly does so to the lymph nodes that are closest to it. As a general rule, there has to have been significant growth of the SCC in the lymph nodes before spread occurs to distant organs like the lung. Cancers of the lips, ears, scalp and face, in general, have a greater risk of metastasising to lymph nodes at an earlier stage of their development than SCCs in other parts of the body. Some SCCs have the ability to invade nerve fibres and then grow along them. This can allow these SCCs to spread far from their original site and makes them very difficult to surgically excise. If the nerve fibre invaded is one that originates in the brain, it is possible for the SCC to track along the nerve and end up growing inside the brain. This is fortunately very rare. How are Squamous Cell Carcinomas Treated? The recommended treatment for an SCC is surgical excision including a safety margin of normal looking skin. If the SCC has not metastasised, then excision with a clear margin is curative. If the SCC is 2cm or greater in diameter; is found to have penetrated 6mm or more into the skin; has grown very rapidly; or is on the lip, scalp or ear, a sentinel lymph node biopsy (SLNB) may be recommended. This is a technique that was originally developed for melanoma treatment but is now being more frequently applied to the treatment of SCCs. If a SLNB is done and spread is found to the regional lymph glands, removal of the remaining glands in that area is recommended. If a squamous cell carcinoma is very large and deeply invasive or if it has spread along the nerve fibres, treatment with radiation is considered after the surgical excision. Fortunately, squamous cell carcinomas are quite sensitive to radiation and the addition of radiation significantly improves cure rates. It is rare to have to consider using chemotherapy to treat SCCs. All patients with deeply invasive, large squamous cell carcinomas, especially in higher risk areas like the lip and ear, will need regular follow-ups. This needs to be done every four to six months to examine for enlargement of lymph nodes and to make sure that the SCC is not growing back. These examples are not to be used as a diagnostic tool. If you have any worrying skin lesions, please consult your doctor.